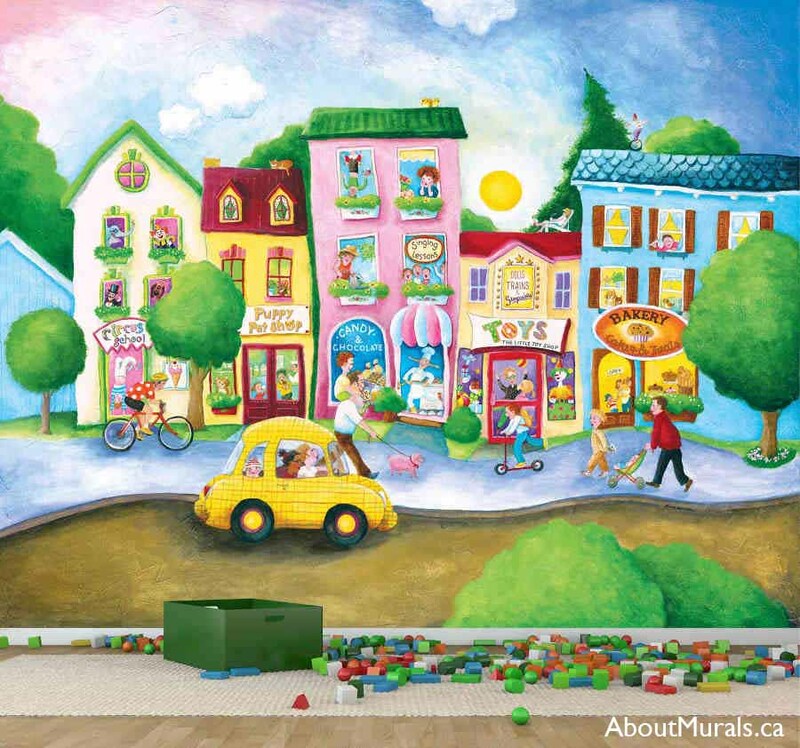 Although this sweet candy mural was painted in Hamilton, Ontario, it’s now available as a removable wallpaper that ships free in Canada and the USA. 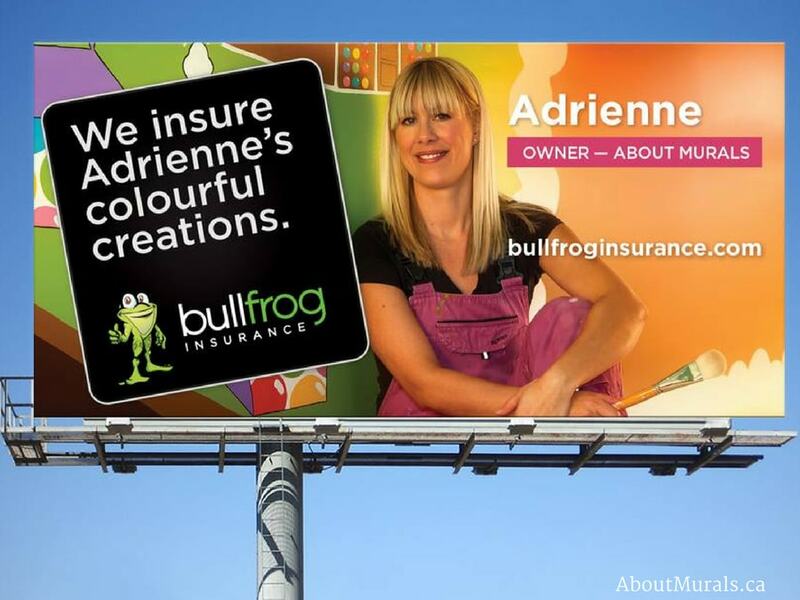 It was also featured in a Bullfrog Insurance marketing campaign! 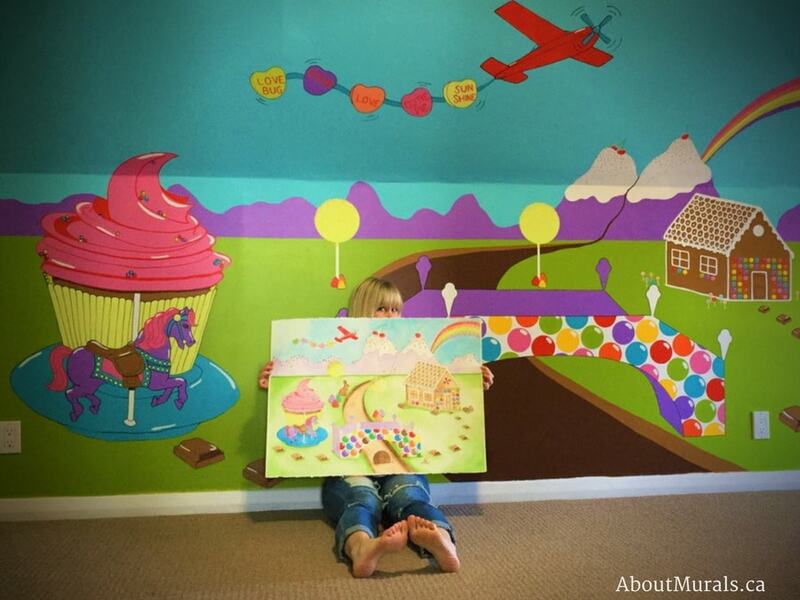 Here are some photos of Audrey’s playroom candy mural to help inspire you! It’ll have you drooling! Audrey is my daughter and she loves all things sweet. She’ll barter with us to eat healthy food as long as she gets a treat after. Her fave game is candyland and loves to bake with me. 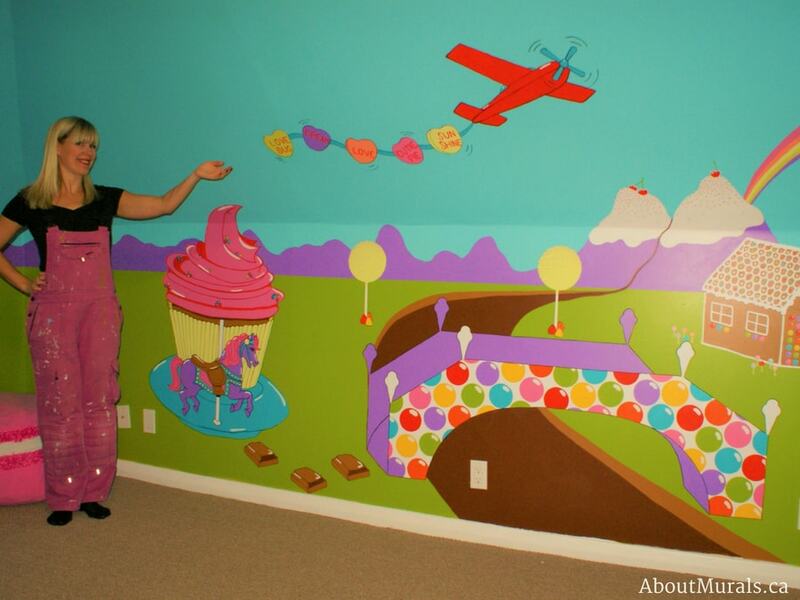 Obviously, a candy mural was the perfect design for her playroom. 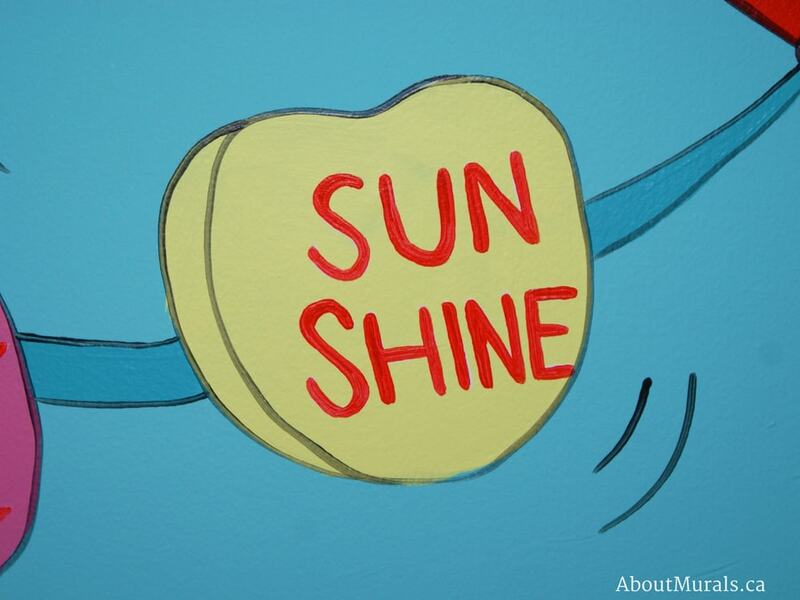 All my hand-painted murals are painted in no-VOC latex paint so that it’s safe for your kids to breathe. It’s Now Available in Removable Wallpaper! 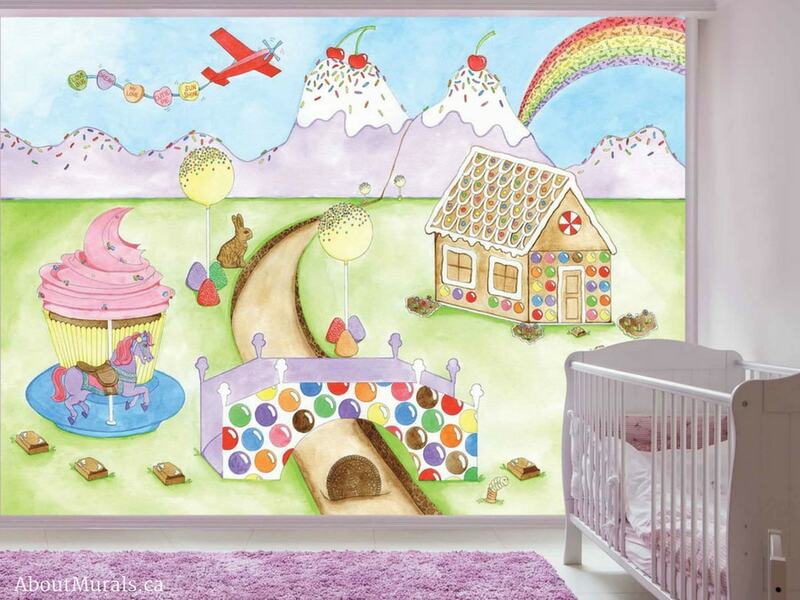 I re-created Audrey’s candy mural onto wallpaper that ships FREE in Canada and the USA. 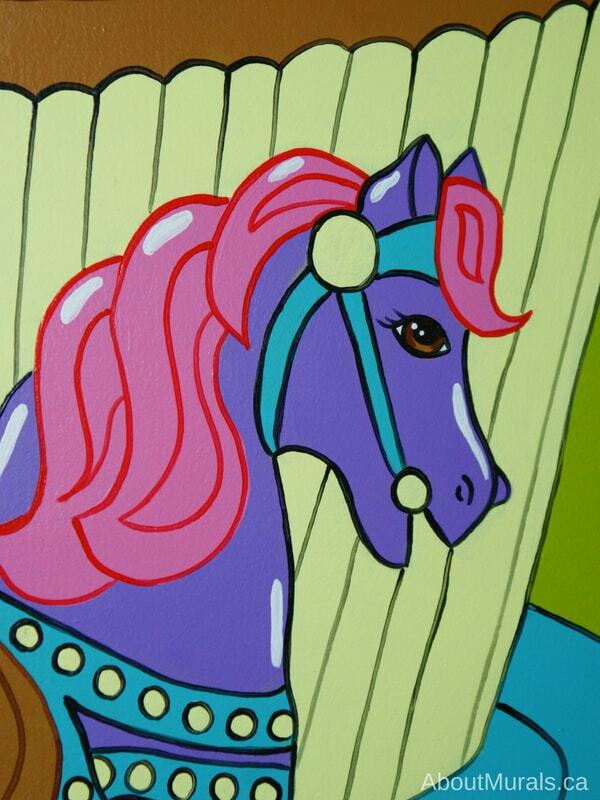 And even my wallpaper murals are non-toxic and eco-friendly! 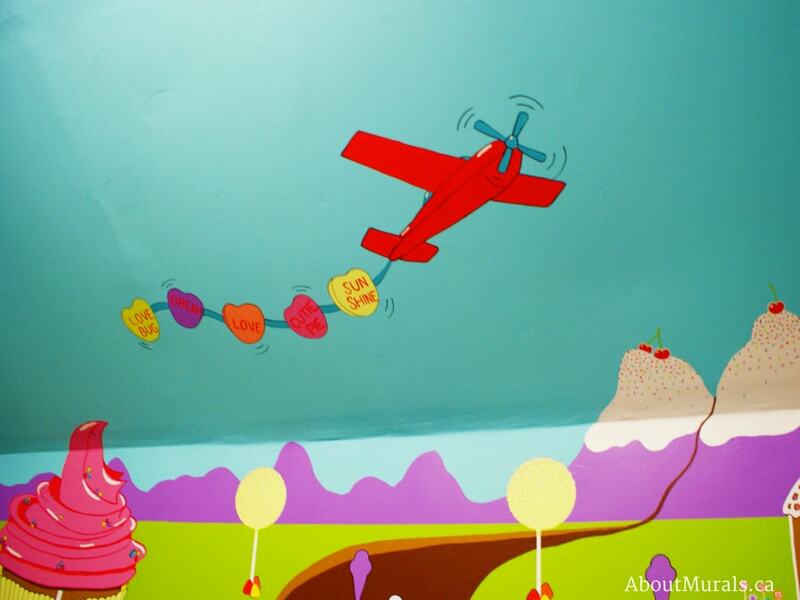 This is how small the candy mural watercolor was before it was turned into wallpaper. Check out the sizes (and prices) that the wallpaper is available in now! 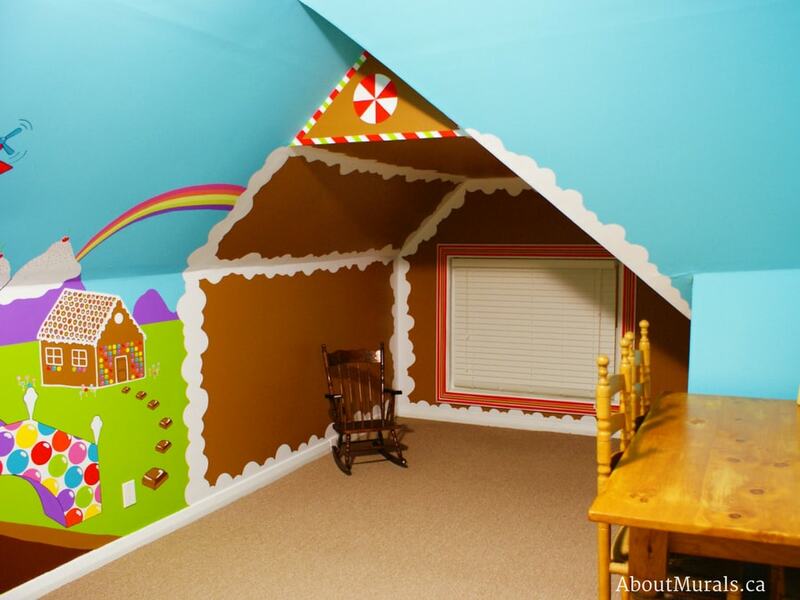 Audrey has great memories of building a gingerbread house every Christmas, so that was a must have in this mural. The gingerbread house is held together with icing, painted in white, and I painted another house in the distance full of gumdrops and candy canes. 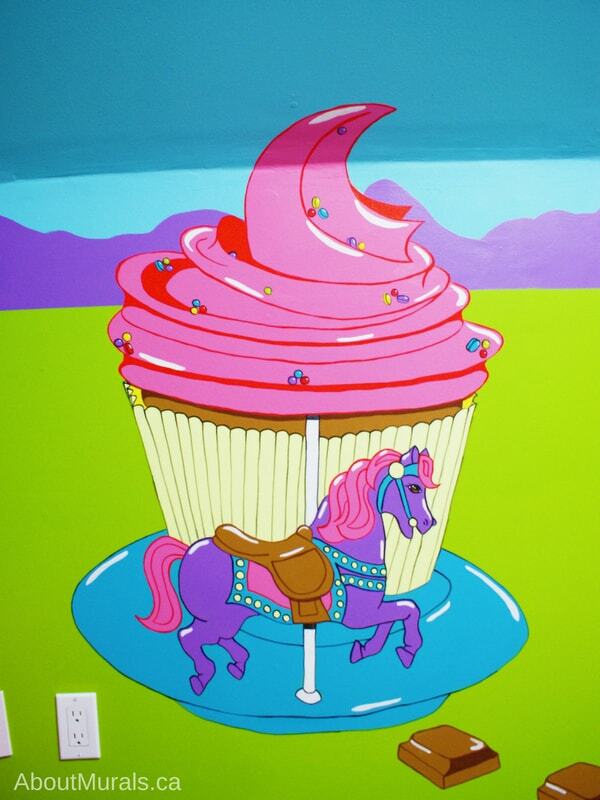 Audrey also loved going on a carousel at a summer fair and constantly talks about it, so I painted a cupcake carousel with a purple horse in her candy mural. Audrey is also obsessed with airplanes. She’s been travelling since she was a baby and loves flying – but she also loves pointing them out in the sky. So I painted a red plane toting sweet tart candies with little sayings that meant something to me, like Love Bug, Dream, Love, Cutie Pie and Sunshine. It was Featured on a Billboard! 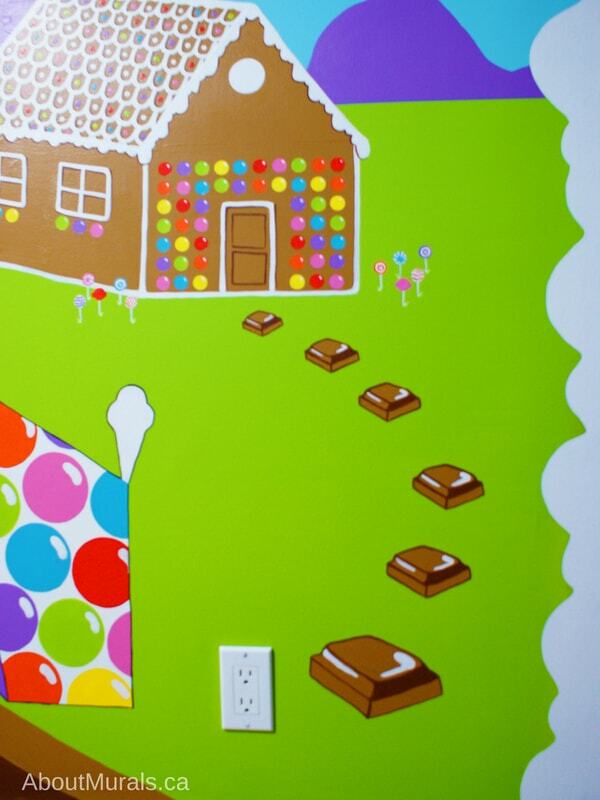 After painting Audrey’s candy mural, I got a call from my insurance company, Bullfrog Insurance. They wanted to feature me in one of their advertising campaigns. I was plastered on billboards all over Hamilton, Ontario – so much fun! Here’s the whole story if you’re interested! Hire me! 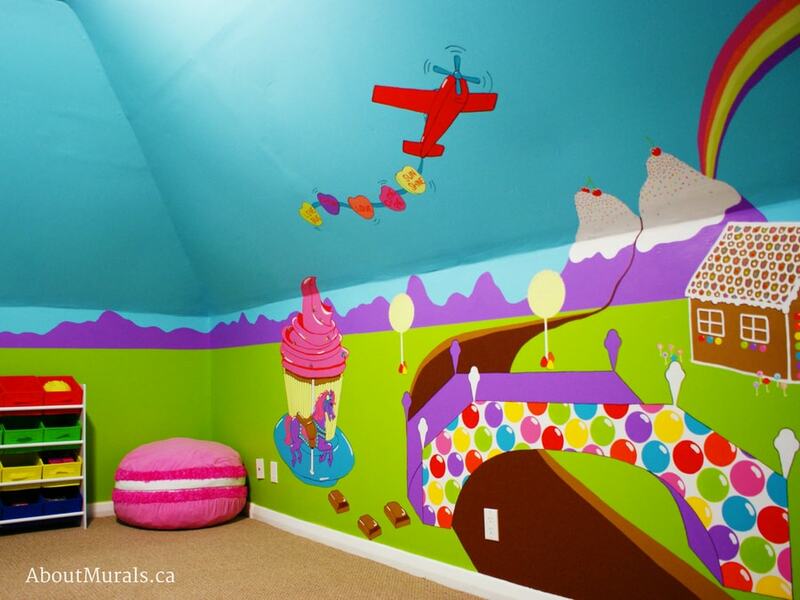 I paint kids murals all over Southern Ontario. Get in touch for a free consultation! Do you love a hot deal, coupon codes, DIY Tips or inspo of pretty rooms? I’d love if you join my newsletter community where I share all of this!